I did get to gently fondle one in the lab before Christmas, but just for 10 minutes to see if DJ Switch's endorsement was a sound one from a platter point of view. It stood up well then, and having put the various modes through their paces, I'm still happy now. I posted the official details yesterday, but now you can read my first look feature right here. I did a few snaps to go with it, but have stopped short of a video. Mike Corlett from the Denon DJ Forum had a unit as well and shot a full 22 minutes of footage for you to look over. If you need any more answers, I have the unit until tomorrow morning, and while I did have plans for a short video showing platter performance, it would be little more than a self indulgent scratch session that Youtube trolls would tear apart. Just take my word for it that it performs more or less as close to vinyl as you can get. I hope it gives you more answers than you had before. Any questions, Denon and myself are here to answer, but check this thread first as many have already been put to bed. 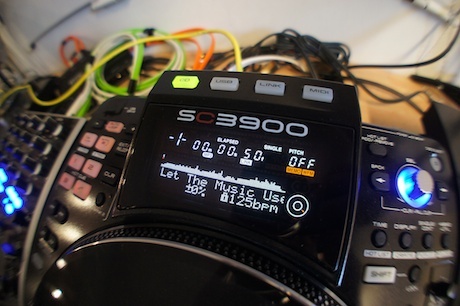 Anyway, click here for the Denon DJ SC3900 first look aka not a review. Not yet convinced that this could replace my gigging gear but I've certainly got a raised brow, mainly because they've got the moving platter technologie nailed for future products or extending this current line. Any info regarding HID feedback from Traktor/SSL to the players screens, track info, waveform ?? "Denon's control placement has often bewildered me"
Denon have always been pretty good at making the simple awkward and or cluttered. A bit of bravery on the size of the hot cue buttons would of been welcome, seriously why do so many manufacturer's go for fiddly little hot cue buttons over a more performance friendly decent sized pad? Im drooling! Wish they focused more on ssl / traktor control as oppose to this new software. I don't see engine as a game changer. I really hope it doesn't affect the overall price of the unit. all i want to know is if it will work with traktor. Hi Gizmo do you know if the new hybrid mode still requires a USB Hub for the pair of decks? Or Is it now possible to use just one USB port and link the decks with the Ethernet Cable? Has the fast search been improved? With the 3700, it's just jumps of 10 or more seconds with lags before the sound comes back. "I have a PC version of their new software and no other drivers as such." "Working with the Mac is easy - fire up Engine, hook up the ethernet cable…"
Looks pretty good to me - i can't wait for the full review the whole media/library/hybrid/needing or not needing a laptop thing is a bit a lost on me a the moment but i will wait for a fuller explaination. Denon can't keep updating old products forever. ....plus if you really must stick with the old hat timecode technology, you can always burn it to a CD and play that. Having used a 3900, I'm torn between hybrid MIDI and the Engine workflow. MIDI gives you the options in the software that the 3900 doesn't have, but Engine is slicker, and feels more responsive. Had a play on one this morning.. works really well, the platter response is excellent.Really powerful motor, solid easy to use but still has loads of Denon style hidden functions when you hold the shift key!